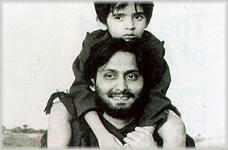 Apur Sansar is known as “The World of Apu” in English. What is lost in translation is the duality of the word “Sansar” in Bengali—-it means both family as well as world. Apu’s detachment from Nature is now complete—–the movie starts with him residing in a dingy one-room near the train lines—-the same train, which symbolized the advent of the outside world in “Pather Panchali”, has by now totally lost its wonderment for Apu for whom the incessant cacophony is nothing but an irritant. Despite being jobless and broke, Apu is happy. He is free as he always wanted to be–from attachments and from tradition. But, in a moment of idealistic impulse, he saves a girl (Aparna) from being married off to a lunatic by stepping in as the groom—-and by force of circumstance, becomes anchored again. A new phase of his life begins where Apu learns to reconcile happiness with the ties of “family” (sonsar). But then Aparna dies during childbirth and his journey grinds to a halt. Turning away from life, he shuns all responsibility for his child (whom he holds responsible for snatching away everything he held dear) and becomes a lonely, broken-hearted recluse. Apu tries to say “father” but all that comes out is ” I am your friend”. Kajal rushes to Apu, Apu lifts him in his arms and both of them ,iridescent in the glow of happiness, walk into the sunset, with the theme of “Pather Panchali” playing in the background. After traversing a long and weary road, Apu has found salvation at last. His world is complete. Undoubtedly, one of Indian cinema’s most enduring moments. Soumitra Chatterjee, soon to become a regular part of Ray’s movies, gives a break-out performance as the adult Apu. Dreamy eyes, expressive face and oscillating between emotional extremes , Soumitra successfully brings out Apu’s essential vulnerability in a way few except him could have. Sharmila Tagore makes her debut in this movie as Aparna. Heavily directed, she does a competent job and is mercifully without the affected Bengali and exaggerated mannerisms she subsequently picked up during her Mumbai days. Sometimes directors in the midst of worrying about cinematic beauty, shot composition and seamless transitions lose sight of the supposedly mundane responsibility of story-telling. Not Ray. “Apur Sansar” is the most story-oriented of all the other installments of the Trilogy and the movie stands on its own purely on the dint of Ray’s amazing capacity to tell a good story in an engaging way—–“Apur Sansar” never drags, the pace is perfect. So even if you are not able to appreciate all the subtle nuances of a master of the craft, you can still walk out of the theatre with the feeling that you saw an entertaining movie. And “Apur Sansar” is all about subtle symbolism. Watch the scene where the village elders come to convince Apu to become the “replacement” groom. The camera goes wide-angle as you see a bewildered, disbelieving Apu surrounded by all the village elders—— poor Apu, striving to break free of all shackles, has been caught, inescapably, in a steadily shrinking net of claustrophobic circumstance. Normally the lunatic husband, who was being foisted upon Aparna, would be depicted as an object of scorn. But such is Satyajit Ray’s deep humanism and compassion that you end up actually feeling sorry for the poor chap—he is as much a victim of this charade as Aparna. Satyajit Ray later went on record saying that, in retrospect, he erred in showing Apu slapping his brother-in-law in anger after hearing of Aparna’s death because it went against the very grain of Apu’s character. Many disagree. The way they see it, the news of Aparna’s death triggers a cataclysmic change in the overtly emotional Apu and he swings to an extreme that is a total refutation of his normal character traits —–he becomes despondent, pessimistic, escapist and hard-hearted (he refuses to even see his child for five years). While the detachment between mother and son was the focus of “Aparajito”, the uneasy attempts at bonding between father and son in “Apur Sansar” are its most emotionally satisfying parts. Kajal, as Apu’s son, wrestles with his desire to gain acceptance from a father he idolizes (note the scene where he says—“My father will come and beat you up”) and the overwhelming sense of hurt at being abandoned for no fault of his own (he throws away the toy his absentee father brings for him) and the child who essays the role of Kajal (possessed with amazingly expressive and sad eyes) admirably expresses this conflict———no small measure due to one of Satyajit Ray’s greatest skills –that of extracting awe-inspiring performances from children. Kajal is Apu’s only source of redemption and in him he sees all that he used to be and has forgotten. Which again brings me to the genius of the final scene—–the father-son reconciliation is an emotionally evocative moment no doubt but it is not a happy, quick-fix solution (Kajal’s trust in Apu has to still progress from friend to father) . Yet it holds out the promise for a better tomorrow thus crystallizing perfectly, in “Apur Sansar”‘s final frame, the theme of the Trilogy —– that regardless of death, poverty and separation, life always holds out hope. In my opinion, the greatest celebration of life ever captured on screen. Read all your three posts on the Apu Trilogy. I saw most if not all of Ray’s movies when Doordarshan ran his movies when he had received his Oscar shortly before his death. Each of your posts beautifully portrayed what Ray captured on camera. 1. Subtle humour and the way it is brought about. Great story telling. 2. Children/Old people and the way Ray brought out the best in them. Ray’s literary works and Feluda in particular was something which I enjoyed even more than Enid Blyton / Hardy Boys in my school days. In the present day, some of Rituporno’s works (Unishe April, Dahan, Shubho Mahurat,Utsab) were some which captured my interest but then with Chokher Bali / Raincoat – I believe it was the actors that took over and not the characters they were portraying. Here’s wishing that the keystrokes continue to flow from your end and readers like me can feast on them. Aacha, how can you say “Apu’s detachment from Nature is now complete—” – I mean, nothing could be further from truth. Waht about his using the rain water to fill up a wash-bucket and then going out in the rain on the balcony? Just coz it’s Calcutta, doesn’t necessarily means it’s ‘anti-Nature’. And later, when he turns into a world-traveller – okay, mebbe he’s not that innocent child returning to mother Nature’s laps, but he definitely seeks solcae in her – always. But even if your comment is supposed to be taken only metaphorically and not literally, it’s overdone, methinks. And on the ‘pace of the movie’…very very true. It’s perfect! @satchisgod, Filling up the bucket with rain water is maybe borne out of necessity (water supply in those days was very sparse…specific times at which there would be water on tap). But yes I did not mean complete in the sense that he is anti-Nature…but his bonds with Nature have been broken for good…while in Pather Panchali he was an intrinsic part of it, here he is the outsider. During his exile, he just rushes to wherever he can avoid human company—he rejects both nature as well as people….imho. What I feel most, in comparison Ghatak was least bothered about the acceptance of his movies. He was never a suitable boy, but truly original. As arnab said, might be fatalistic (if you think of â€œSubarnarekhaâ€) but too poetic and his metaphors were always breathtaking. His story narrations were also far diverse and unlike main-streams (Ajantrik or Jukti-tokko-goppo). @Debanjan, Ajantrik was an amazingly original movie…and yes Ritwik Ghatak was never subtle and never made apologies for it. a tangential remark. on the subject of pace, i think if the script has a good dramatic pace (in the sense that the story is moved along all the time, as is the case with most of ray’s films), then the director’s role in setting a pace is made a lot easier. there is a remarkable sequence from solaris which brings home the idea of pace at quite a different level of sophistication. in this sequence, the protagonist is preparing for his journey into space. he sets up a fire outside his house, in which he tosses all his papers, and photographs. the camera gets up close and begins to pan the scene, and then comes to rest on a sheet of paper in the fire. the camera’s momentum is now passed on to the fire, which advances slowly at the same pace on the paper, dividing the frame into an ever-enlarging space of black and grey ashes and an ever-receding patch of white. tarkovsky’s technique is so pristine and pure that words cannot describe the beauty of it. @Anon…I have to sheepishly confess to not having seen the original tarkovsky but the bastardized Hollywood version (Clooney)…but what you said (and boy did you say it well !) sounded amazing. bangabandu you captured exactly what i felt when i saw apur sansar eons back. Ray is undoubtedly the greatest director india has ever produced. In 1967, he wrote a script for a movie entitled “The Alien”. Columbia Pictures were in talks to produce this movie. Peter Sellers and Marlon Brando were rumored to play the leading parts. However Ray was surprised to find that the script he had co-written had already been copyrighted and the fee appropriated. Marlon Brando dropped out of the project and though an attempt was made to bring James Coburn in his place, Ray was dissilusioned and had enough of Hollywood machinations and returned to Calcutta. Columbia was interested in reviving the project in the 70s and 80s but nothing came of it. When E.T. was released in 1982, many saw striking similarities in the movie to Ray’s earlier script. Ray believed that Spielberg’s movie “would not have been possible without my script of The Alien being available throughout America in mimeographed copies.” Spielberg denied this by telling “I was a kid in High School when this Script was Circulating in Hollywood”. beautiful post. some more on ray please. Yes dear Anon who addresses me as bangabandhu…have heard that one before. Which is why I never liked Spielberg. @DD…more posts on Ray will follow of course…. I can only add that in my opinion the highlight of the movie is not the acting of Soumitra but that of the child actor playing Kajal. Ray really knew how to make children act! Had heard a lot about your blogsite………………and read many of your blogposts. But reading this post has particularly created an urgency in me to see ‘Apur Sansar’ once again and relive the magic of Satyajit Ray. Thank you for giving me a break from ‘bollywood movies’……..as that’s what i am currently hooked to (phase i am going thru’). Saw this movie when I was an 8 year-old kid (thanks to DD). Watched it again only a year ago, and was able to finally appreciate the subtleties. Great review. One suggestion though – Do you mind putting this review up on imdb? The current set of reviews could really do with a review such as yours. Read it for the nth time and that too at office. Amazing post, the whole series is brilliant and inspiring. Saw Apur Sansar again today and was really enthralled again. Satyajit Ray knew how to make films that can be seen again and again and feel joy about life’s diversity every time. By the way, I saw Rittik Ghatak’s Meghe Dhaka Tara sometime back and felt it to be one of the greatest films made by and Indian. It’s stunningly stylish!